Nearly 40 percent of older adults have issues with digestion related to aging, and it has a lot to do with our bodies changing as we age, including our digestive health. A variety of factors take a toll on our digestive system as we progress through life, including our lifestyle and any medications we might be taking. It is no secret that aging places us at a higher risk for all kinds of health conditions. As we age, some bodily functions slow down, including digestion. When it comes to digestive health in our older years, the muscles in the digestive tract can become stiffer and weaker. The tissues are also more apt to become damaged, since new cells just don’t form as quickly as they did before. 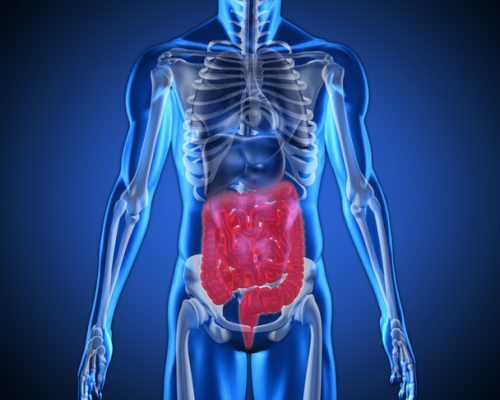 Many people seem surprised by the effects of aging on the digestive system. They think they are in the minority. However, nothing could be further from the truth. The effects of aging on digestive system activity can vary from person to person, but the most common denominators are the esophagus and the stomach. The strength of the esophagus changes as we age without any problems, but some people develop diseases as they get older that can interrupt esophageal contractions. When it comes to the stomach, the lining’s ability to deal with any damage decreases as we age, which opens us up to peptic ulcers. As well, decreased elasticity in the stomach when we get older means that we can’t take in as much food. Conditions such as gastritis become more common. Below you will find a more comprehensive list of digestive problems as we age. Dementia, stroke, and Parkinson’s disease – can cause difficulty swallowing, which leads to digestive imbalance. Diverticular disease – small pouches in the lining of the colon bulge out along weak spots in the intestinal wall. Gas, bloating, cramps, and constipation can occur. Constipation – difficult or painful bowel movements due to bodily functions slowing down, medication use, or inactivity. Polyps – the risk of developing polyps increases after the age of 50. GERD – gastroesophageal reflux disease is a common upper gastrointestinal disorder, which can cause heartburn and other symptoms. Being overweight – increased weight can lead to acid reflux and heartburn as fat pushes the stomach into the chest. Sensitivity – although we don’t know why, as many people get older they can’t seem to tolerate spicy food, alcohol, or caffeine in the quantities they used to. Some changes to digestion related to aging are impossible to control. For instance, we can’t control the speed at which new cells are formed. Still, there are many steps we can take to improve our digestion after the age of 60. Some of those steps relate to lifestyle adjustments. Eating a low-fat, high-fiber diet that is rich in fruits and vegetables has been helpful for a lot of older people. Staying hydrated also tends to make a big difference. Dietary experts suggest, as we get older we should be drinking twice as much water as the alcohol and coffee we consume. Exercise – regular exercise, such as walking, swimming, or riding a bike can be helpful for our digestive health. Monitor medication – ask questions when prescribed medication. Find out what impact it might have on your digestive system. See if there is an alternative and if it has potential to cause digestive problems. Manage weight – managing your weight can help prevent digestion issues and many other age-related health problems. Get health screenings – regular screenings will catch any problems early so they can be addressed before they progress into something more serious. Like most health problems, prevention is the best approach when it comes to keeping your digestive system working properly. Many of the tips mentioned here are not only good for older adults, but also effective for people at any stage of life. They can help protect digestive health and promote overall wellbeing. The truth is, we should be able to digest any food we put in our mouths, but unfortunately this isn’t always the case. Lifestyle, changes in food processing and preparation, and of course, aging don’t always respond well to what we eat. In many cases, high-fat foods and processed foods can send our guts spinning, leading to acid reflux, heartburn, and pain. It’s incredible how uncomfortable a person can feel and even more amazing how just a simple adjustment in diet can eliminate that discomfort. Additionally, a quick medication change can make the difference between feeling miserable and having a tame tummy. If you are experiencing digestive symptoms, such as acid reflux, heartburn, bloating, cramps, excessive gas, diarrhea, or constipation, speak to a doctor. There’s a chance there could be an easy fix.